The American university professor Richard Kieckhefer tells us that in the Middle Ages there were wizards who, with their invocations, caused frosts and floods which destroyed trees and crops. In Sweden and other neighboring countries, many wizards were taken to court because they were accused of destroying their neighbor's harvest with flood and calamities which they themselves caused. Naturally, witches and wizards are capable of doing the same damage anywhere and everywhere. This is why, in the old days our more pious ancestors who lived in the country would “plant” a cross in the middle of their garden and fields as a weapon against the evil and criminal spirits. Witches can also do harm to dumb animals. The demons drowned the swine in the sea. Witches, too, with their invocations, can do the same; they can kill animals. There was a man who was deceived by his wife. In order to keep him, the wife, instead of having recourse to God, went to the devil, i.e., to a wizard, and begged him to tie her husband to her. The wizard made a figurine of wax in the likeness of her husband. He then wrapped it in a net and bats’ wings, at the same time making invocations to Satan. And the “miracle” happened. Yes, indeed! We also know of cases where men have “returned” to their wives because of the murderous devil! Suppose there’s a woman who wants to make somebody fall in love with her. She goes to a witch, who sets the ball rolling. According to one practice, she draws the naked man in pigeon’s blood on the skin of a dog. Thereafter, she “censes” and so on, performing all the necessary actions for the invocation of Satan. The husband began to withdraw from his wife. When he returned home, he vomited! Whenever he got into bed with his wife, he jumped straight out again. A powerful force propelled him out of bed and onto the balcony. One evening, without warning, the icon-lamp in the house, which was lit, exploded into tiny shards. The mirror in their bedroom smashed into smithereens. In the end, he abandoned his wife, whom he had loved so much, and moved in with the woman he’d laughed at and mocked! * It prevents … adultery! There was once a husband (an initiate of magic), who was about to set off on a long journey. He was certain that, during his absence, his wife would cheat on him. In order to keep his mind at rest, he asked the devil to guard his wife. This done, he left. The first thing his wife did was to introduce men into the house. Every evening she received “visits”. But what happened? No sooner did the woman get into bed than an invisible force propelled the stranger away from her. Every time she attempted to commit adultery (and she did so, often) the same pattern was repeated. In the end, try as she might, she was unable to cheat on her husband. Let’s say somebody is sick. This person is suffering. There is no hope for a cure. In their despair the relatives ignore the Merciful, Crucified Lord and turn instead to the misanthropic and murderous devil (a witch or wizard), in the hope of finding a cure. The witch, with a doll, figurine or photograph in front of her, begins the therapy, her assistant being the devil and her medicines the bones from the left side of a frog, the blood of a hoopoe or a pigeon, the heart of an eel, the skin of a snake, a shroud or a blue stone. Archimandrite Meletios, from the Holy Monastery of Gregoriou on Athos, who is a missionary in Zaire, tells us how in 1984 he visited the town of Kolwezi. He found there a shaman who was curing lots of people through his magic. St. John Chrysostom tells us how the devil, as our enemy, doesn’t want what’s good for us. If he does cure us, he doesn’t do so for our benefit, but to harm us. “The demons drove you out of Paradise, they deprived you of that heavenly honor, and now they’re going to cure your body? They have no pity on the soul, so are they going to pity the body? They showed no mercy to the pigs they drowned in the sea, so why should they show any to your body?" And even if, with God’s permission, the devil does cure you, don’t think he’s done you any good. He might have helped your body, but he’s certain to have harmed your immortal soul, because the devil knows only how to do harm. Of course, God allows the demons to cure you, in order to teach you a lesson, i.e., not to have anything to do with demons even when they’re curing you. I would rather die than run to Christ’s enemies for a cure. What’s the good, if my body is cured and my soul is harmed? What’s the benefit of a little relief here on earth, if it means being cast into eternal fire? And yet you, a Christian, instead of mourning, rejoice and are proud that the devil has made you well! In 1994, the High Court in Athens sentenced a witch to imprisonment because she had exploited her cousin for financial gain. It’s worth looking at the way this extremely cunning woman fleeced her victim. The events, as they are related here, are taken from the court proceedings. The witch divorced her husband in 1978. She then took up with and lived with somebody who made out that he was a wizard, a spiritualist and an astrologer. In order to fool their clients, they set up a separate room in their house, a special “oratory” that had icons, incense and candles, as well as magic symbols such as the pentagram and so on. And people, unfortunately, kept coming to them. As luck would have it, right next to them was her cousin’s family home. He was the head of the financial section of the Social Security Office in Agios Stefanos, in Attica. At work, he was honest and hardworking, but as a person he suffered from nerves and had psychological problems. In 1986, he went to his family home to make some repairs. His witch cousin invited him in for coffee, introducing her boyfriend as her husband. The latter represented himself as someone who had dealings with saints and so on and as someone who did good to people with problems. This stuck in the mind of the cousin and he gave it great thought. No more than a week passed before the man knocked at the door of the witch and her lover, requesting their help. The wizard took him into a separate room, the “oratory”. He told him to lie down on a bed, unbutton his shirt, undo his belt and relax. He palpated various parts of his body and produced total relaxation and “calm”. In the end, he read some incomprehensible words over him. His cousin, the witch, was at his side all this time. “That’s right,” agreed the witch with some warmth. As you’d expect, the poor man was panicked. But his relatives told him they were more than willing to help counteract the spell. “Borrow it and don’t tell anybody why you want it,” advised the wizard, who, at the same time, was conjuring with the lights in the room to produce effects aimed at proving his miraculous powers. And this did the trick. They played on him to such an extent that he had complete confidence in them. By various “magic” practices, they reduced him to a compliant tool and he did whatever he was told. He even gave over some of his inheritance to them. But that wasn’t all. He himself acted as a servant to them in their home. As we mentioned, the victim had a good job. He was head of the financial section of the Social Security Office in Agios Stefanos. These relatives of his now gave thought to the way they could best make use of his position. Whereas previously he had served at his post honestly and fairly, he now felt impelled by a strange force to steal money from work. This he did and handed it over to his “saviors.” This was in June, 1988. He kept on stealing and stealing. He was giving his relatives tens of millions of drachmas a month! When he found it difficult to steal, his cousin would get on the telephone and stiffen his resolve. All in all, he stole and handed over to them the sum of 282,210,000 drachmas, while he himself didn’t have enough money for a square meal. On November 29, 1991, the wizard was killed in a traffic accident. The witch was now all alone. The Social Security Office finally caught up with the thief. Nobody could understand how this man, who was such an honest head of a department, could have stolen money. Charges were brought against him. His cousin arranged for lawyers to defend him and she herself paid their fees, because she was at risk herself. The victim was held in temporary custody. He had with him a variety of magic amulets and tokens which were gifts from his cousin. Moreover, the witch, who was concerned that he would come to his senses and give her away, visited him regularly in prison. She gave him lots of support. But away from her constant, daily influence, the victim slipped away from her. He did, indeed, come round and recognize his “gaffe.” He confessed. Another lawyer undertook his defense. The witch panicked. She had to do something to protect herself and so she did. On the day of the trial, the new defense lawyer, according to his own report, felt strangely and uncommonly unwell. He could hardly stand and was unable to think clearly. He couldn’t make a speech. It was the first time anything like this had happened to him in all his years as a lawyer. His secretary suffered from similar symptoms. The witch had in fact performed her magic. Although the lawyer had been indifferent towards religion, he went to confession the same afternoon, as did his secretary. They had a blessing service read and the office sprinkled with holy water. At once they recovered. They went to court. The witch vehemently denied that she had forced the victim to steal money or that she had paid his legal expenses. Naturally, the court wasn’t convinced. In August 1994, she was sentenced as the moral instigator of his crime. The magicians told their victim that he had been put under a spell, and that he would die in two months. In other words, they told him outright lies. If anyone goes to magicians (or astrologers or fortunetellers) and is told that a spell has been put on them and so on, they can be sure this is a lie. They told him these lies in order to fleece him of his money. If you go to magicians, they’ll lie to you and fleece you as well. The man had psychological problems, but instead of doing the decent thing and lending him moral support, they seized the opportunity to destroy him! There is no humanity in these witches and their like. They’ll stop at nothing. Poor, wretched people, who go running to liars to find a solution to their problems! 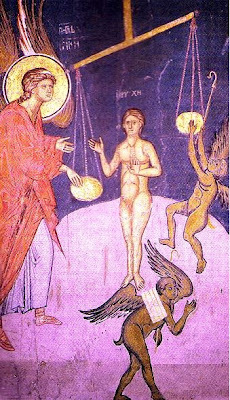 From the book Confronting the Devil, Magic the Occult, Orthodox Book Centre, Athens 2003.